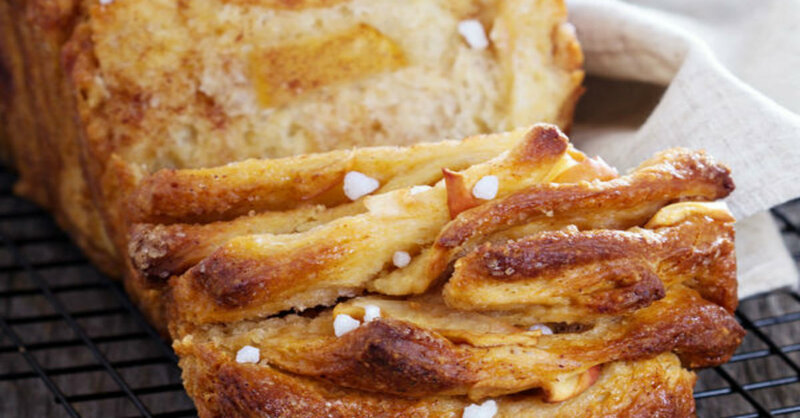 Mmmmm, This Recipe For Cinnamon Apple Strudel Pull-Apart Bread Is Our New Favorite! This recipe is a little more complicated than your average pastry and includes making your own dough and getting crafty with how you prep it for baking. However, the extra effort is absolutely worth it, because you’re rewarded with a delicious sweet bread that’s super fun to eat: you get to magically pull the bread apart with your fingers! See, in the long run we saved you the time and hassle of having to cut this treat with a knife! This pull-apart bread is perfect for breakfast or an on-the-go snack, and if you’re going to go through the trouble of making this dough, why not make two batches? Then you can freeze one and make this yummy recipe again, after you (and possibly others) gobble down the first loaf! For the dough: whisk together water, 2 tablespoons sugar and yeast in a small bowl or glass, and set aside for 5-10 minutes. If mixture does not froth and bubble up, discard and start again. In a medium bowl, combine butter, milk and vanilla, and mix together. In a separate large bowl, mix together 2 cups flour, remaining sugar and salt. Then add butter and milk mixture, yeast mixture and eggs. Mix well until dough begins to form. Add in another 1/2 cup flour and mix until sticky dough ball begins to form. Transfer to a lightly greased bowl, cover with plastic wrap and place in a warm, draft-free place for 60-90 minutes, or until doubled in size. Line a 9×5-inch loaf pan with parchment paper and, in a medium bowl, combine apples, sugar, flour, cinnamon and nutmeg for filling. Toss well so apples are coated. Mix together melted butter and vanilla in a separate bowl or glass. Turn dough out onto a lightly floured surface and roll into a 12×20-inch rectangle. Brush thoroughly with vanilla butter and evenly spread apple slices out on the dough. Then sprinkled with remaining cinnamon filling mixture. Using a very sharp knife or pizza/pastry cutter, cut dough into 6, 3 1/2×12-inch pieces. Stack the 6 pieces on top of one another and cut stack evenly into another 6 pieces. Take the sliced sections, turn them on their sides and place them in the loaf pan, one in front of the other. Cover loaf pan with a clean kitchen towel and let dough rise another 30-60 minutes, or until doubled in size (again). Preheat oven to 350º F.
Place in center of oven and bake for 40-50 minutes (covering with foil after 30 minutes), or until deep, golden brown. Remove from oven and let cool for 15 minutes, then lift parchment paper out of loaf pan and let cool completely. Optional: sprinkle sea salt over the top before serving.